NEW YORK – Once the second most powerful man in Detroit politics, former Detroit City Council President Charles Pugh was arrested this morning in New York on six counts of criminal sexual conduct. Authorities are alleging Pugh had an inappropriate relationship with a young teenager he met while working here in Detroit as a reporter and anchor at Fox 2 news in 2003-2004. The boy, who is not being identified, was 14 years old at the time the two met. 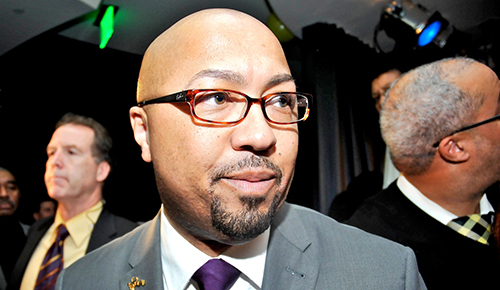 Pugh’s fall from grace has been long and painful since he fled Detroit in 2013 following allegations he sexually groomed a teenager through his Charles Pugh Leadership Forum mentoring program at Frederick Douglass Academy for Young Men. Though no charges were filed, the young man at the heart of this case, Khody Sanford, took Pugh to civil court. The allegations and subsequent case cost Pugh his career and professional reputation in Detroit. Ultimately he lost the case and was ordered to pay Sanford $250,000 in damages. Pugh initially appealed the verdict before eventually agreeing to begin paying the plaintiff. Living in Manhattan since news of the Sanford case was released, Pugh, whose once impressive career as a journalist was also destroyed by the scandal, has allegedly been working in various restaurants for the past three years. It was in New York – Harlem to be specific – that he was arrested this morning through cooperation between the Detroit Police Department and the U.S. Marshals service. Authorities now hope to extradite him back to Detroit and begin legal proceedings. “Despite what the defendant has meant to the city in the past, and the positive work he did here, we cannot and will not turn a blind eye to these alleged facts,” said Wayne County Prosecutor Kym Worthy in a statement. Between The Lines has learned that the man in the new case, who is now 27, first met Pugh when as a member of the Mosaic Youth Theatre he appeared on the weekend news program Pugh was anchoring. Sources say the young man initially inquired about becoming an intern. Though that never came to happen, the boy would go on to build a relationship with Pugh that included visits to Pugh’s downtown Detroit apartment where authorities are alleging the inappropriate relationship developed. Now, Pugh is to be charged with three counts of criminal sexual conduct in the first degree and three in the third. While criminal sexual conduct in the third degree in punishable by up to 15 years in prison, the maximum sentence for a first degree conviction is life.